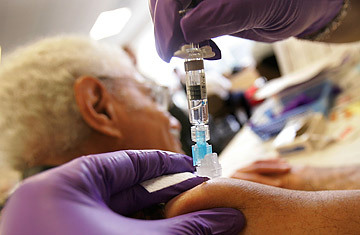 A senior citizen is administered a free flu shot at New York-Presyterian Hospital's Allen Pavilion. Does the Flu Vaccine Really Protect Kids? How Long Does Flu Immunity Last? Flu season is still about a month away, but the U.S. Centers for Disease Control (CDC) wants Americans to get vaccinated now. There's no cure for the influenza virus, which in its worldwide perambulations can mutate from a simple runny nose-and-sore-throat to a fatal illness. Each year, 36,000 Americans die from the flu, but thanks to National Influenza Vaccination Week and a record number of available doses, maybe this year will be better. But there many other subtypes of influenza to which humans are immune. They reside mostly in birds, although every once in a while a strain will suddenly develop the ability to infect people. "A virus like that gives people no time to develop protection or immunity, so almost everyone is susceptible," says Dr. Carolyn Bridges, an influenza expert at the CDC. "When that happens, we have a pandemic." Influenza is a disease of modernity: the faster people travel around the world, the easier it is for the virus to spread. There's no evidence of influenza among Native Americans until after Europeans visited North America. Pandemic outbreaks occur about once every hundred years, although it's hard track outbreaks that occurred before the 18th century due to incomplete medical records. The disease hits big cities first  because that's where people generally travel  and then spreads to surrounding areas. The last major pandemic occurred in 1918 when an Influenza A strain jumped from birds to humans and killed an estimated 20-40 million people (3% of the world's population). The pandemic struck during World War I and warring nations worried that the enemy might use the virus to its advantage, so most news reports of the outbreak were censored. Spain remained neutral during the war, and its accounts of the virus's horrific symptoms caused the illness to be nicknamed the "Spanish flu," even though scientists now believe it originated in the United States. "This wasn't like normal flu," says Frank Snowden, Yale University's chair of the history of science and medicine department. "Physicians were horrified by what they saw. People's lungs filled with this terrible frothy fluid. They were literally choking to death. It was ghastly." Symptoms appeared so suddenly that victims sometimes died within just one day. The flu hit World War I soldiers especially hard; some historians believe more soldiers died from the flu than from the war. Asia has been plagued by periodic bird flu outbreaks among its poultry population since the mid-1990s, the largest outbreak occurring in 1997 when eighteen people in Hong Kong came down with the virus. Outbreaks also occurred in 2001 and 2002, leading to the culling and destruction of millions of possibly-infected fowl. By 2003, the strain had spread to much of Asia's bird population. "It remains a serious pandemic threat," says Bridges. "It has a 100% mortality rate among poultry, but so far we are not seeing the type of molecular changes required to jump to humans." The influenza virus was discovered in the early 1930s, and scientists developed a working vaccine by the 1940s, when it was first used on soldiers during World War II. In 1947, Jonas Salk, one of the vaccine's creators, began to develop a polio vaccine, which was perfected and approved in 1955. Today's influenza vaccine contains three strands of the virus, as determined by the World Health Organization (WHO). A global network of scientists survey the virus's mutations over the course of a year. "They see how the virus is changing, where it's changing, and the geographic spread of the new variance," says Bridges. The WHO holds two vaccine strategy meetings each year, one for the northern hemisphere (in February) and one for the Southern (in September). As soon as the organization announces which influenza subtypes should be targeted by the vaccine, medical labs work furiously to develop a shot. Everything happens on a very tight schedule  the FDA must approve the vaccine by the spring, the vaccine must be in production by August and be ready to be administered in October-December, so that people have enough time to develop an immunity by the time flu season comes around in January. The process doesn't always go smoothly, of course. In 2004, California-based Chiron Corp. had to scrap 48 million doses of the vaccine  half the U.S. supply  when regulators discovered that it had been tainted with bacteria. Americans were urged to reserve shots for the ill or elderly, but so many people opted out of shots that the country actually ended up with a surplus. "That was a rough year," says Bridges. Everything appears to be on track this year; with somewhere around 146 million doses, Americans who choose to roll up their sleeves should remain largely sniffle-free this season. There's also a nasal spray, featuring a live but severely inhibited strand of the flu, that seems to work best on children. Information on how to receive the flu vaccine can be found on the CDC's website, www.cdc.gov. Read "How Long Does Flu Immunity Last?"